Dubai: Gulf Finance House witnessed a sudden spurt in volumes on Sunday along with price gains. Traded volume stood at 130 million in the past two sessions until Sunday, compared to an average of 10-20 million shares. Shares of GFH gained 3.27 per cent higher at Dh1.010. GFH has gained 11 per cent in the past four trading sessions. “The stock has been seeing accumulation, and GFH may rally back higher towards the higher targets at Dh1.01/1.05 in the short term,” Shiv Prakash, senior analyst with First Abu Dhabi Bank Securities, said in a note. Emirates NBD shares extended gains for another session after the bank re-negotiated the price of its acquisition of a bank based in Turkey. Emirates NBD closed at Dh12, up 1.27 per cent. “The trend is very bullish in Emirates NBD and the stock is headed next towards level of Dh14/14.77,” Prakash said. FABS had a buy on Emirates NBD at Dh9.60/10.70. The Dubai Financial Market general index closed 0.17 per cent higher at 2,780.95. In other stocks, Emaar Properties closed 0.4 per cent lower at Dh4.98. “Emaar is posting the higher trading value as shares rebound closer to book value with a slowdown in momentum near technical resistances,” Issam Kassabieh, Senior Financial Analyst at Menacorp said. Traders on the Abu Dhabi Securities Exchange (ADX) were indifferent without taking any consideration of the merger story or a denial from First Abu Dhabi Bank (FAB) and Abu Dhabi Islamic Bank (ADIB). FAB closed 0.26 per cent higher at Dh15.20. Dana Gas rose as much Dh9.99, its highest level since December 2018 before witnessing profit-taking. 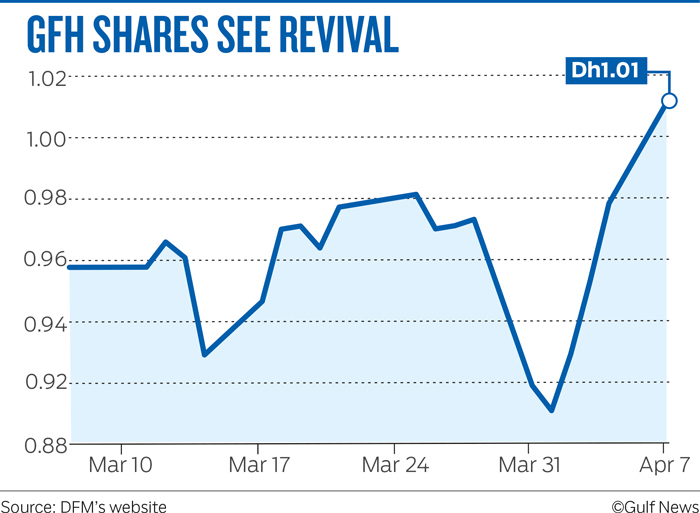 “If Dana Gas breaches over Dh1.01, the stock may extend gains towards Dh1.05/1.15 in the near term,” Prakash said. Adnoc Distribution rose 8 per cent higher at Dh2.70. “If Adnoc breaches its all-time high of Dh2.90, it may rally to Dh3.20 in coming weeks,” Prakash said. The Abu Dhabi Securities Exchange general index closed 0.40 per cent higher at 5,052.49. Elsewhere in the region, Saudi Tadawul index was at 9,023.17, down 0.45 per cent. The Muscat MSM 30 index closed 0.79 per cent higher at 3,970.49. The Qatar exchange index closed flat at 10,192.19.